The Japanese asteroid sampling mission Hayabusa2, launched on December 3, 2014 aboard an H-IIA rocket from Tanegashima, Japan, has nearly completed its long flight to asteroid Ryugu (formerly 1999 JU3) after a five year mission and an Earth flyby. 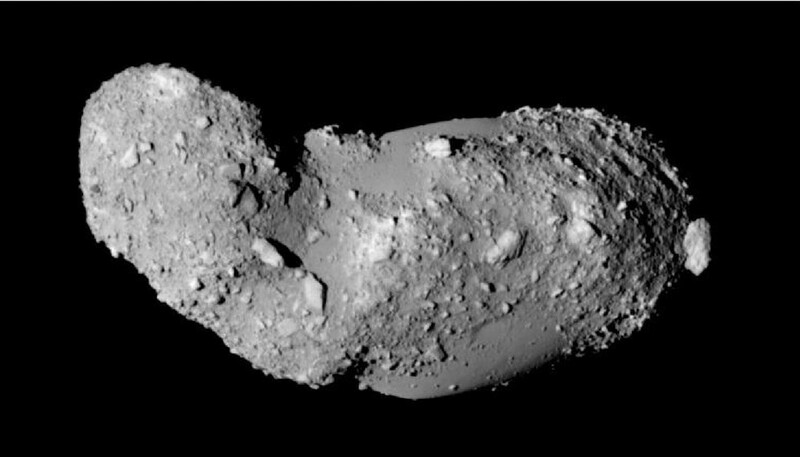 The mission was approved as a follow-on to the Hayabusa mission which became the first probe to sample an asteroid when it landed on the young “rubble pile” asteroid Itokawa, though the mission had its share of problems. The Hayabusa mission to Itokawa had problems with one of its four ion engines from the start of the mission after a solar flare damaged the craft and two reaction wheels failed before its approach to Itokawa. The hopper that was supposed to land on the surface missed the asteroid and flew off into deep space, the sampling mechanism did not function properly, and although Hayabusa was able to land on Itokawa, it suffered thruster leaks and another ion engine failed during the trip home, and contact was lost for several weeks after the second landing on Itokawa, delaying Hayabusa’s departure to Earth. Despite this, 1,500 microscopic samples from Itokawa were successfully returned and examined after the capsule landed in the Woomera test range in Australia in 2010. The Hayabusa2 follow-on has one more reaction wheel (to make four) and improved, higher thrust ion engines, along with a backup asteroid sampling system, and the spacecraft is in good health so far. Hayabusa2 is a 600 kilogram (1300 pound) spacecraft that is based on the Hayabusa craft, with some improvements. It is powered by two solar panels and uses an ion engine with xenon propellant as its main propulsion source. The ion engine technology was first used in the Deep Space One experimental spacecraft in the late 1990’s and also has been successfully used in the Dawn asteroid probe as well. Although the thrust is very low it is continuous and can be used to propel a spacecraft to very high velocities over time, very efficiently. The craft also features thrusters and four reaction wheels to maintain its position in space as well as four auxiliary lander/hopper craft, a sub-satellite, and an impactor, along with sampling mechanisms, a full suite of science instruments and a reentry capsule to return samples to Earth. The Hayabusa2 mission is intended to image and sample the asteroid 1999 JU3, discovered in May 1999, now known as Ryugu, and to return samples of the asteroid, including samples excavated from an impactor to collect materials from under the surface, to Earth for analysis in laboratories. 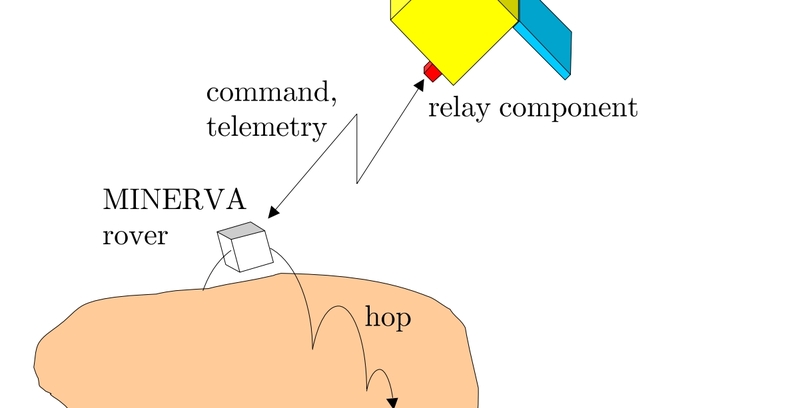 Besides the primary and backup sample collectors, the mission includes three MINERVA “hoppers” similar to the one used on the original Hayabusa mission that will land at several locations on the surface to study these locations with cameras and thermometers. An impactor (SCI) with a 2 kg pure copper lump (Liner) will be used to excavate a crater on the surface, and there will be a sub-satellite that will be released to observe the impact. The main imaging instrument is the ONC (Optical Navigation Camera) which has telephoto and wide-angle modes, and which is being used right now to provide optical images of Ryugu, which are being used to navigate Hayabusa2 safely to the asteroid. Once at Ryugu, this instrument will image the surface. Other instruments that will be used are the TIR (Thermal Infrared Camera) which will measure the asteroid’s surface temperature, the NIRS3 (Near Infrared Spectrometer) which will check the distribution of minerals on the surface using the 3 micron band, and the laser altimeter (LIDAR) which measures the distance between the spacecraft and the asteroid. 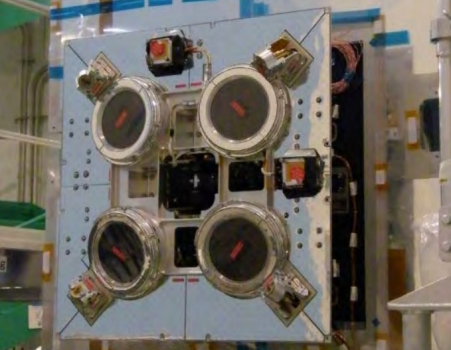 International contributions include a small robotic lander (10 kilograms or 20 pounds) called MASCOT that is a joint venture of DLR (Germany) and CNES (France), while NASA is providing communications through the Deep Space Network. MASCOT’s purpose is to provide extremely detailed mineralogical and geological surveys of the asteroid’s surface, providing up to 16 hours of data with a battery set to last 2 asteroidal days, and will use four instruments (MicrOmega – a hyperspectral microscope, MAG – a magnetometer, CAM – a camera, and MARA – a radiometer) to do this. 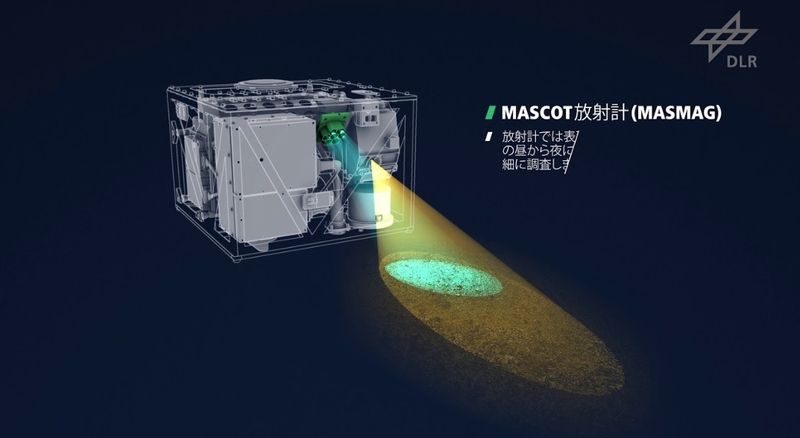 MASCOT will “jump” to various sites on the surface using a robotic arm to study these sites in detail, after being released from Hayabusa2 100 meters (328 feet) above the surface of the asteroid. MASCOT systems are based on designs from Rosetta/Philae, Phobos-Grunt, and ExoMars. The Hayabusa2 craft has finished its first correction burn and is now less than 600 kilometers (372 miles) away from asteroid Ryugu. Over the coming days the asteroid, which is now seen as a small round object, will become much more visible and surface features will be seen. The craft is also searching for any satellites that may be orbiting the asteroid, and have not detected any so far (detection limit: larger than 50 cm). Other asteroids such as Ida have been found to have satellites, and satellites can be hazards to navigation for spacecraft like Hayabusa2. Ryugu itself is approximately 880 meters wide (nearly a kilometer), rotates around its axis every 7 hours 38 minutes, and is thought to be very dark (0.05 albedo). Ryugu orbits from a distance just within Earth’s orbit to as far as just outside Mars’ orbit around the Sun, and its orbital radius around the Sun is 180 million kilometers (111 million miles), orbiting the Sun in 1.3 Earth years. It is believed that Ryugu is an older C-type asteroid that may have material from the beginning of the solar system (including water and organics), or at least more ancient material, as opposed to Itokawa, an S-type asteroid. Ryugu appears to be mostly spherical, unlike Itokawa’s potato shape, and we are seeing the asteroid in more detail as the spacecraft draws closer. Its arrival at Ryugu is set for June 27th, and Hayabusa2 will be 20 km (12 miles) above the surface on that date, as things currently stand. The arrival will be followed by a press conference in Sagamihara, Japan. After arrival, Hayabusa2 will start imaging the asteroid, with medium altitude observations at 5 km (3 miles) starting at the end of July. 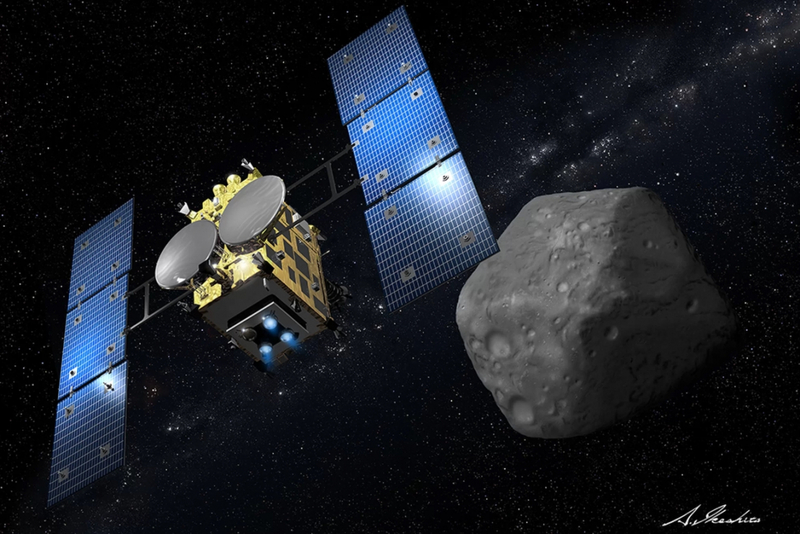 In August, Hayabusa2 is set to measure the asteroid’s gravity by going to an altitude of 1 km (0.6 miles) above the surface, and in the fall (September – October timeframe) the first touchdown and MINERVA deployment are set to occur. 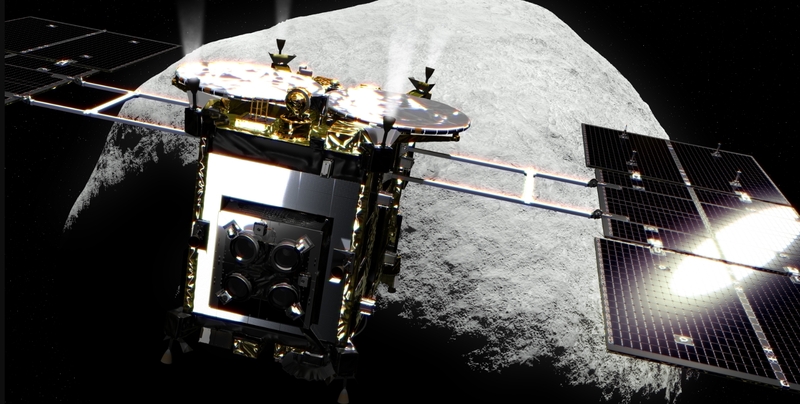 After solar conjunction in late fall (November – December) where communication will not be possible with the probe, Hayabusa2 will resume contact afterward and conduct more medium altitude observations at 5 km to start 2019, with the second touchdown in February and the artificial crater experiment using the impactor in the spring (March – April timeframe). The third touchdown on the asteroid will follow in April or May, and another MINERVA deployment will follow in July. The Hayabusa2 craft will remain near Ryugu until the end of 2019 (November or December) when it will depart for Earth after 18 months at Ryugu. The sample delivery reentry capsule is set to be returned to Earth in late 2020. Asteroids are remnants of the building blocks of the solar system and can tell us important details about how the solar system, and by extension Earth and ourselves, came to be, and asteroids can and have endangered life on this planet throughout geologic history. Most notably, a 10 kilometer (6 mile) wide asteroid hit the area of the Yucatán in Mexico 65 million years ago and ended the reign of the dinosaurs. A future asteroid could pose a similar threat to humanity and Ryugu is classified as one of these “potentially hazardous asteroids” (PHAs) in the Apollo group. What we learn about these asteroids will inform how we intercept one if the time ever came. Finally, asteroids are being looked at as potential sites for mining metals for future industries, and the composition of asteroids like Ryugu will inform mining plans as well. For all these reasons, missions like Hayabusa2, Osiris-Rex (to approach Bennu in 2 months), and others are very important efforts to understand the solar system. It’s clear that a lot of engineering and precision is needed to achieve these maneuvers, far from home and in a zone that doesn’t easily give second chances. So as Hayabusa 2 moves towards its target, astronomers on Earth are looking at Ryugu as much as they can to learn about its properties. “Before you can send an interplanetary mission to a small body, it is important to know its orbit with the best possible accuracy, but you also have to know the object’s properties,” said Thomas Mueller, co-investigator for Hayabusa’s thermal infrared imager instrument, in an email to Seeker. He is also leading the efforts to do a characterization of Ryugu before Hayabusa 2’s arrival. Mueller, who works with the Max Planck Institute for Extraterrestrial Physics in Garching, Germany, has been interested in learning about small bodies in the solar system since his Ph.D. thesis, which he completed in 1997 — where he tried to apply infrared measurements of well-known targets to objects that were less well known, but still scientifically interesting. He’s been working to characterize Ryugu (in collaboration with the Japan Aerospace and Exploration Agency, or JAXA) since 2008. Specifically for Ryugu, Mueller says the latest research will help engineers adjust their instrument settings, do risk assessments and develop plans for what the spacecraft will do when it gets there. Some of the things they have covered include Ryugu’s estimated size, brightness (known as albedo), rotation period and spin axis, thermal properties and where grains of different sizes are distributed. But there are challenges with observing a small object from so far away. The new paper notes that because Ryugu is nearly spherical, it made it hard to get a light curve. So the astronomers combined radiometric and lightcurve inversion techniques to come up with an estimation of Ryugu’s physical and thermal properties. He added that both Itokawa and Ryugu are “fantastic opportunities” to see how well models hold up against ground truth. The astronomers are lucky to have this opportunity, as only a fraction of small bodies are visited by spacecraft, he said.